6-Quart Stainless Steel Pressure Cooker Perfect for today's lifestyle! Cooks three to ten times faster than ordinary methods, faster than a microwave for many foods. Cover lock indicator shows at a glance if there is pressure inside the cooker. Bimetal-clad base provides fast, even heat distribution. Gleaming stainless steel body ensures lasting beauty and easy cleaning. Includes cooking rack and complete instruction/recipe book. Extended 12-year limited warranty. 6-Quart Liquid Capacity (5.7 Liters). Pressure cookers have experienced renewed popularity over the last several years because cooks have rediscovered what some cooks (particularly grandmas) have known for a long time--they're really fast. And it's easy to cook healthfully with pressure cookers, since the food retains so much more of its nutrients and flavor. Presto's 6-quart stainless steel pressure cooker is a multi-purpose pot that can stand in as a conventional soup pot as well as perform the kitchen magic that pressure cookers are famous for. Chicken Cacciatore cooks in 8 minutes! This professional-quality stainless steel pressure cooker is a handy addition to any well-rounded set of kitchen tools. The heavy-duty lid locks down during cooking; an inner sealing ring keeps the steam in. In addition to a pop-up pressure indicator and a simple steam release mechanism, there is an overpressure plug that will let off steam if it builds up excessively. This pressure cooker is useful for weeknight dinners or for any meal that needs to come together quickly. An accompanying booklet contains more than 65 recipes, ranging from basic soup stocks to stews and pot roasts--even desserts like 5-minute custards! Tenderize lean cuts of beef or pork; or cook chicken, fish, or vegetables faster than you can in a microwave, and without losing moisture. Terrific item, make sure you purchase the Stainless Steel model. The aluminum ones may leach into the food after prolonged use MAKE SURE YOU HAVE LIQUID IN THE COOKER BEFORE YOU HEAT IT!!! Melted my first one! Mother in Law liked ours so much......SHE TOOK IT for herself!...aaarrgghh! We liked it so much WE BOUGHT A SECOND ONE for ourselves! HANDS OFF MOM! Go to the Presto website and order the drop-in basket; it helps keep the veggies in one place and makes them easy to get out of the cooker. This is a great product. I replaced a 4 qt. aluminum that needed $30.00 worth of parts. Stainless steel construction is great. Five star rating. Just one problem....lid would not go on because of the new gasket. I finally discovered I needed to push down slightly on the middle of the lid to align the lugs. After that, it was easy to install the lid. Instructions made no mention of this small problem. Great product, works well, heavy-duty triple-clad bottom, induction ready, too. I wanted stainless steel--easier in the long run, to clean and to cook in. Six quarts is just about the perfect size since I rarely cook for a crowd anymore. This is a nice, solid, reliable cooker. Presto does a good job on the owners manual, some basic recipes, etc. The cooker has a little rack so you can keep your meat off the floor of the cooker. This is not a canner. You could (and I have) use it as a little baby canner for a small load of small jars. I have used it as a canner for about 4-5 pints. The instructions do not say this is a canner, and you probably should know what you're doing if you plan to can with this. It takes about the same amount of time whether you can in this or in the giant cooker, so why not do a large load, I say. Pressure cooking doesn't necessarily save time depending on what you're cooking, when you consider it takes a while to build the pressure. This takes some practice, and knowing your food and your stove. I like it because it cooks meat really tender quicker than any other method. It takes very little experience to get to know the proper pressure without a guage. It makes a rythmic rocking noise, not too fast,not too slow. Just the right size and much lighter than our old cast aluminum model. I purchased this for my mother who loves to cook (for everyone). She uses it and has never complained. It helps her cut the cost of using her oven. This is my first pressure cooker and I really like it. For this price, it is a good choice for those who aren't sure if they will use it much. It is especially useful for vegetarians. Beans that normally take 2 hours to simmer in a sauce pan are done in 20 minutes in the pressure cooker. I was afraid to use it at first but there are safety features which should make you comfortable using it. As long as it is under pressure, you cannot open the top. There is a little discoloring from the food. Its inner surface has turned a bit darker in stead of the original shining. I believe it is because I do not bother to scrub the surface hard enough. (I use plastic brush rather than wool steel) Unless you use a Teflon coated one, you will see such discoloring. Anyway I don't like too much of chemicals(Teflon) as long as the food does not stick to the surface to make cleaning miserable task. I used to have an Aluminum Presto before and it worked very well before it was broken accidentally. I bought another brand for replacement from a department store. But the new brand leaks water vapor. So I look at the web and find back a Presto with stainless steel. Very tasty way of using less energy! We used it and it worked very well. The steam vent was not as noisy as some I have used. The safety catch and anti-vacuum valve worked very nice too. We put the cooker in cold water too be able to open it sooner, but the safety catch is pressure activated so you know you won't get burned. I tried to heat something in the cooker before putting the lid on, and it was difficult to put on. I am not deducting starts for this because it was not designed to work this way. I had never used a pressure cooker before but have been planning to buy one for a while, and decided to buy this one because it looks well made and has good reviews. I tried cooking several vegetables and some Sirloin tips (separately) and found the Sirloin surprisingly tender, the vegetables retained a lot more flavor. I did carefully read the instructions and after one or two uses found it easy to use. I bought a timer to use with it because cooking times seem to be important as does making sure it does not boil dry. 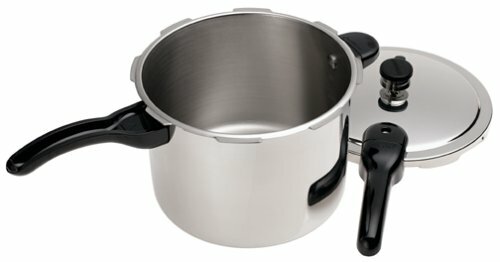 The reason I like this item is that the price is very attractive for a pressure cooker beginner. One star for (1) a very simple structure so that it is easy to clean especially the lid. The second star for (2) a very easy to learn and follow the instruction because of the simple structure. The last star for (3) the price. The only negative feedback is that the quality of stainless steel must be the lowest one. I burn the meat a little before putting the vegetables and water, and the pressure inside didn't scrape it off when it's cooked. I used the soft scrub and stainless sponge, but the burn doesn't go. The little burn like this is immediately gone in All-clad (stainless steel) I have used for a long time. Three generations and no complaints yet.